Copycat Chocolate Macaroon Larabar Bites. Have you seen the new Larabar Bites? I made you some Copycat Chocolate Macaroon Larabars! 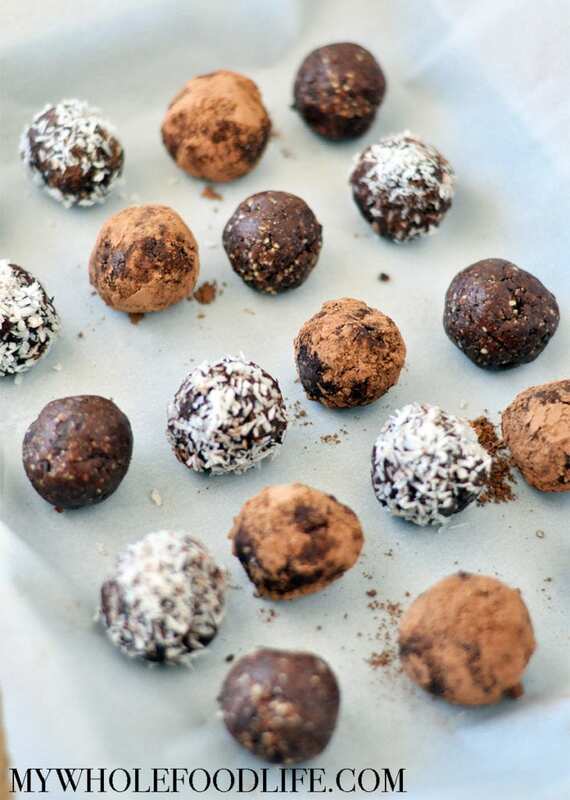 They are meant to be dessert truffles instead of snacks like the original Larabars. These Copycat Chocolate Larabar bites are so much cheaper to make yourself. The bites are almost like a rich chocolatey truffle with hints of coconut. They only take a few minutes to make and only 6 simple ingredients!! These bites of yum are vegan, gluten free and paleo. They also freeze well too if you want to keep a stash on hand for chocolate cravings. Looking for more bite recipes? Rich chocolatey flavor with hints of coconut. Just 6 simple ingredients to make! In a food processor , add the almonds, chocolate chips and unsweetened coconut. Blend into a fine consistency. Then add the dates and coconut flour and continue to blend. Lastly, add the water, 1 tablespoon at a time, until the mixture clumps together. I used 2 tablespoons. Roll balls and place them on a lined baking sheet. If you like, you can roll them in more shredded coconut or cacao powder like I did.